Razor wire or barbed tape is a mesh of metal strips with sharp edges whose purpose is to prevent passage by humans. While razor wire is much sharper than the standard barbed wire made to rip and grab onto clothing and flesh. 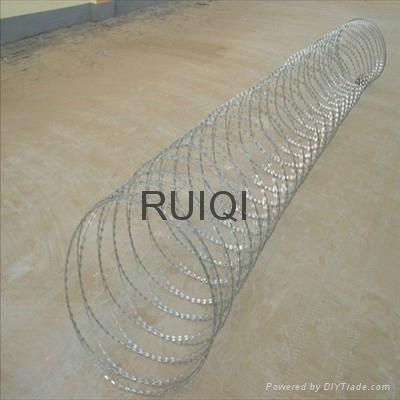 The multiple blades of a razor wire fence are designed to inflict serious cuts on anyone attempting to climb through and therefore have a strong psychological deterrent effect. In many high-security applications, barbed tape supplanted barbed wire, which could be circumvented relatively quickly by humans with tools, while penetrating razor wire barriers without tools is very slow and difficult, giving security forces more time to respond. 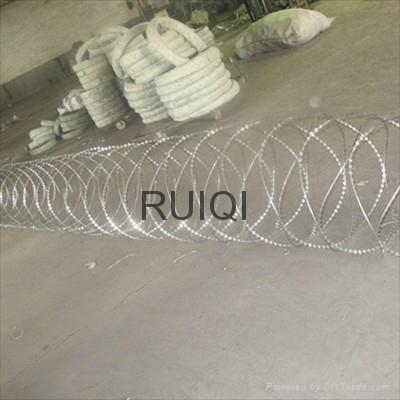 Razor wire contains a core hardened steel strip that is often under tension, so if cut, it strikes the cutter. Airports,prisons,military areas and the areas that require maximum deterrent and protection. 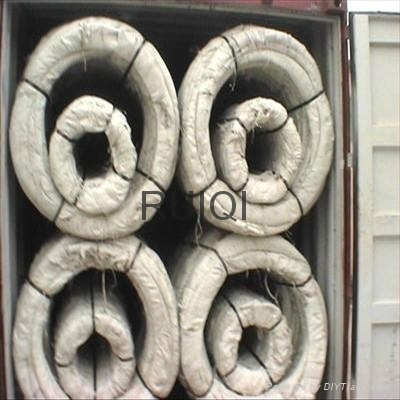 Hot dip galvanised, heavy galvanised,stainless steel and epoxy coated. The number of loops per coil: This determines the amount of Razorwire on the coil and therefore the profile density when deployed, an important point when comparing prices. All our coils have 55 loops per coil! Stainless Steel or Galvanised? The environment the product is being deployed in may determine whether SS or Galvanised is the best option. Stainless Steel is more expensive but offers greater durability especially in salt air environments. However Galvanised is more than adequate for most regions and applications, but check the level of zinc coating when selecting Razorwire, all our Galvanised products are 200gm/m2, if the supplier doesnt know, it may only be 60gm/m2.